I've just switched my phone on after landing in Beijing, only to get the news that Lee Davis-Conchie passed away as we were flying to China. I know a lot of people have been following Lee's story over the last few years. Lee was my student, an instructor in our school and my friend. Just over two and a half years ago he phoned with the shocking and unexpected news that he had leukaemia. Since then he went through a roller coaster journey with many emotional highs and lows: 12 gruelling courses of chemotherapy; an ultimately unsuccessful bone marrow transplant. In the beginning it seemed unthinkable that Lee would not come out victorious in the end. He was just that kind of apparently indestructible person. Who goes through 7 hours chemo and then goes out into the hospital grounds to practice his spear form? Who leaves the cancer ward with a drain hanging out of his chest to do a Chen Ziqiang Cannon Fist seminar? Many people have Chen Xiaowang's calligraphy hanging on their walls. Lee had it inked onto his body - alongside a dramatic tattoo of Chen Wangting. A year after getting his calligraphy he showed a surprised, to say the least, Chen Xiaowang his art depicted on skin instead of the usual rice paper. You get the picture. This was a man who thought about more than himself. This was a man who took joy in living his life and helping others to live theirs. This was a man who inspired people. In a rare role reversal, Chen Ziqiang asked to have his picture taken with Lee as he found his attitude inspirational! Lee seemed to be in a good place. He was ready for a second transplant, this time from a donor from Israel. It seemed like there was still a fighting chance for him - according to the doctors it was as close to a 100% match as was possible. Only a week ago Lee was coming to train when he got a severe headache. It turned out he had had a brain haemorrhage. A few hours later he was given the devastating news that his life could now be measured in days. I wrote most of this blog on the plane to Chenjiagou accompanied by an eager group excited at the prospect of training at ancestral home of Taijiquan. Yesterday we were with Lee. A real warrior - no self pity, meeting his next journey head on and making sure that the people left behind we're OK. Lee never managed to fulfil his ambition of training in the village. So he donated a little piece of himself to be laid at the tomb of Chen Wangting. 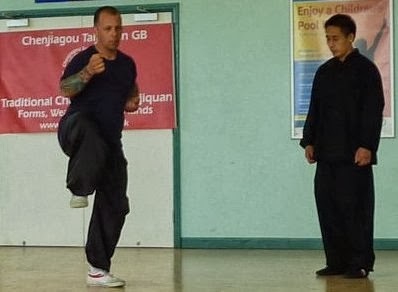 Chenjiagou Taijiquan GB is a close family and like all families we sometimes lose loved ones. But their presence and influence carries on within the family. At the end of his life Lee said to me "they say I've inspired a few people", clearly taking comfort from this. You don't have to come from Chenjiagou to be a warrior... Sitting with Lee at the end of his life he introduced Davidine and I to one of his nurses as his mentors and inspiration. This truly brought a lump to my throat, coming from someone who had just taught me a life lesson in how to face the unfaceable. Lee was 44 years old when he died. I salute you my friend for living what so many only talk about. Then you are a true warrior!